Removed by original poster on 12/08/16 - 22:40:25 (GMT). but the images are wide below the limit of 3.072kb (ca. 300 -500kb)?? This issue has been highlighted to the publisher and I hope he or I will get back to you shortly. This issue has been tackled, but keep the file size down to avoid further issues. Hi is it only subscribers that get the photo button on top of the page? I am not a subscriber and have not got a photo button.If only subscribers get this option how can I post pics? Your help would be greatly appreciated. A aircraft modeller thats joined the darkside!! Things have changed slightly since this thread was started, but everyone can add photos. Subscribers have a larger storage limit, but otherwise anyone can use the gallery. Instead of PHOTOS, the link is now labeled GALLERY. You should see it above. Just click the GALLERY link on the menu bar above and then look for the MY PHOTOS link in the upper left. You can save photos and set up albums there. After that, it's just a matter of following the process outlined in this thread for adding photos to your forum posts. Thanks Mark C,I have added photos of my first armour kit in my photos and will try to add post tomorrow as its only now that I have got home and I am shattered.Thanks Ken. I attempted to post as per the above instructions, however, on my new computer(windows version 10,000 or whatever)when I right click on the photo all I get is copy, share or ask Cortana, no properties. I attempted to manually copy the image location and it posted a link(no photo). I also tried the linked image icon to the right of image location and only got a tiny picture. My photos are within the 800x600 pixel parameters and below the maximum Kb size, so I am at a loss. This the first time in a few years that I have posted here and the first time with this brand new computer. Any help to resolve this issue would be greatly appreciated. "You rarely get what you expect...you get what you inspect!" Man, sorry it is still being cranky. I am exploring how to explain adding photos to our forum posts easily. This image is in my gallery as a small thumbnail. I clicked on it and it enlarged. A slightly quicker way is simply to right-click the full-size image and Copy Image Location. That makes a hot link of the proceeding URL http://gallery3.kitmaker.net/data/500/OKC_RR_Museum_2_8_0_14_1000x708_.jpg. You just have to click the '[img]' button at far right below the post page text box, and insert the URL string. I'll give it a shot. Thanks Brother. Removed by original poster on 07/02/17 - 07:48:42 (GMT). Michael your attempt was basically correct except that you copied the location at the top of the page rather than under the image. Thanks for your help, Darren. I got it figured out. 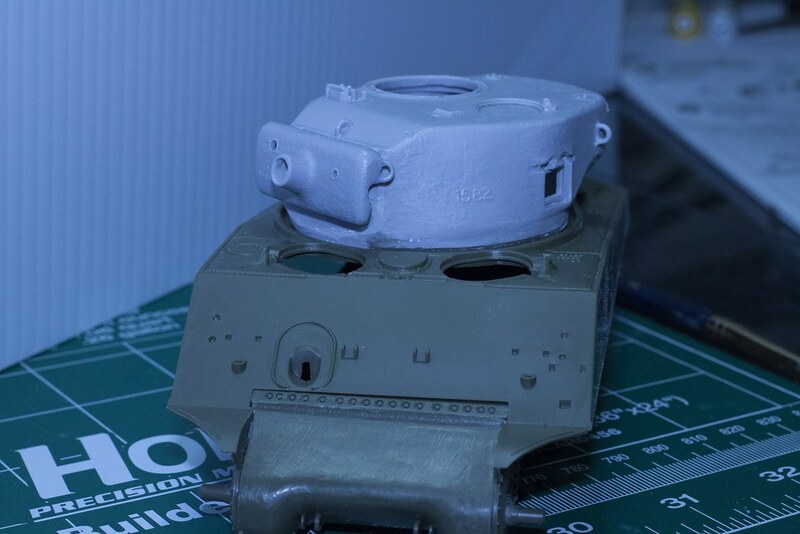 Great-looking turret on your Sherman. It definitely has the look of a true-to-life steel casting. Were the numbers on the turret already engraved on it, or are they something you added? Removed by original poster on 01/22/18 - 02:04:06 (GMT). Removed by original poster on 01/22/18 - 02:07:03 (GMT).